Little kids love to help out around the house, including doing the laundry. Instead of trusting your toddler or preschooler with your delicate duds, let her help with a pretend washer and dryer. She can practice sorting whites and colors without the risk of accidentally dying everything pink and still feel like she's helping out. 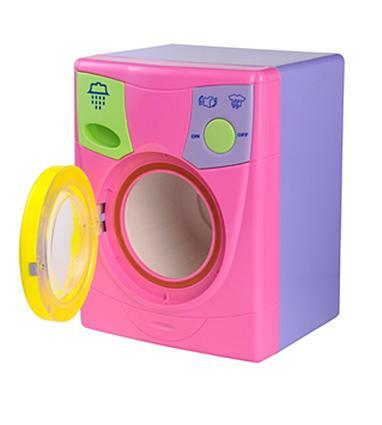 These pretend play washers and dryers are designed to be the perfect height for your little helpers. Some actually make washer sounds or show water swirling around, while others require your child to use a little more imagination. Depending on your child's mood, the Little Colorado Washing Machine can function as a washer or a dryer. It comes with a see-through door so children can see the clothes inside move when they turn the wooden crank. Purchase the machine with a natural or white/pink finish or choose the unfinished wood version and paint it yourself. On the high-end of toy washers and dryers is the Steffy Wood Products Washer/Dryer. It comes with a washer compartment and a separate dryer compartment, along with counter on top for folding and sorting clothes. Children can also turn the knobs. While made of high-quality wood, some children may be disappointed that it looks more like a cabinet than an actual washer and dryer. Kenmore does not just make appliances for adults. The My First Kenmore Washer and Dryer resembles Kenmore's actual stackable washers and dryers. Children can add pretend soap and turn the realistic looking knobs after putting their laundry into the compartments. It is in the same pink color as the rest of Kenmore's play appliances. If you want more than just a play washer and dryer, some pretend washers are attached to entire laundry centers. Your child can do the washing, drying, ironing and maybe even some cooking all in the same place. Soon he may be ready to take over the real thing! For a complete, inexpensive laundry center, check out the My Very Own Laundry Center. It comes with a pretend washer/dryer, an ironing board and baskets for storing pretend laundry supplies. According to reviews, the product is made of very flimsy plastic and sits somewhat lower than most play sets for kids. The Little Tikes Deluxe Wooden Kitchen and Laundry Center fits all of your child's pretend play needs. Not only does it come with a washer and dryer combo with a timer, but they are connected to a kitchen. It also comes with a laundry basket, iron and multiple kitchen accessories to add to the play. According to the reviews, over 90 percent of those who have purchased the set would recommend it to others. It is praised for its quality construction, classic look and its storage space. The only big complaint is how long it takes to put together. Dolls and stuffed animals can do laundry too. These washers and dryers are designed to be used by children as they play with some of their favorite toys. They are also ideal if you do not want to have a larger child-sized washer and dryer sitting out all of the time because they are small enough to be easily stowed away when not in use. With the Miele Toy Washing Machine, kids feel like they are actually doing the laundry. Not only does the machine make realistic washer sounds, but they can add water and watch it swirl through the door. It is designed to be the height of a standard American Girl or other play doll. The doll's clothes can actually be washed in the machine. Standing 10 inches tall, the Educational Insights Washing Machine is the perfect height for most dolls. It has water in the door to make it look like it is actually running when your child pushes the different buttons. Keep in mind this washer is designed for dolls, so it may be too small to hold a child's t-shirt. 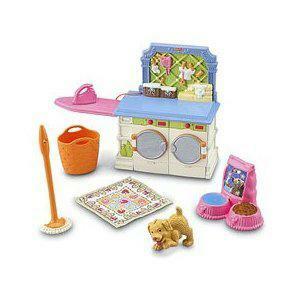 The Fisher-Price Loving Family Laundry Room is the perfect addition to a dollhouse. It comes with a side-by-side washer and dryer with actual opening doors, an ironing board and the other accessories children need for their small dolls to do the laundry. The washer and dryer hold the rugs and other home accessories that are part of the Loving Family collection. Even Barbie can do laundry. 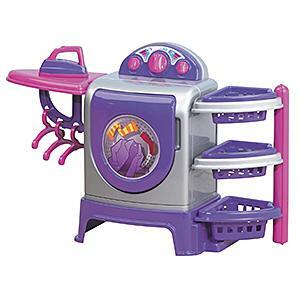 The Barbie Spin to Clean Laundry Room comes with a washer and dryer that actually spin. A Barbie-sized laundry basket and a Barbie doll, dressed for doing laundry, are also included with the set. After practicing with toy washing machines and dryers, your child will be ready to try her hand at the real thing. Let her practice her new skills by letting her throw a few clothes into the washer or help fold the clothes as they come out of the dryer. However, even though your child may be a pro at using her pretend washers and dryers, make sure she stays away from the real things when they are in motion. Washers, especially front-load washers, can pose a safety risk to curious children, so sticking to running pretend models may be best.